Marty was a uniquely skilled basketball player who excelled in all facets of the game. Yet he was so much more. Dave Strain, legendary former coach of the Cobblers, described Marty as his greatest player in 28 years of coaching. 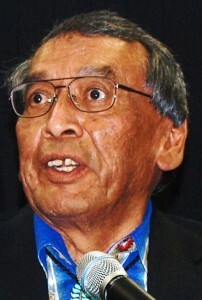 “He brought to his high school and college basketball careers not just his amazing athletic achievement,” Strain said of Marty, “but also the values of his parents and the Lakota Sioux culture, the values of sharing, generosity and courage.” Marty led the Cobblers in scoring as they finished fifth in the Class A state tournament in 1966. That set the stage for a heroic senior year. Rapid City opened its 1967 season against Mitchell at the Corn Palace. Marty hit a difficult shot from the corner as time was expiring to sink the Kernels 61-59. A few weeks later the 6-foot-3 forward exploded for 40 points against Lead to establish a school single-game scoring record. When the Cobblers reached the state tournament, Marty was dominant at the Sioux Falls Arena. He scored 31 points in a first-round victory over Miller, then came back with 26 in a semifinal win over Pierre. In the championship game, despite extended bench time due to foul trouble, Marty netted 22 in a 50-43 loss to Milbank. He was named tourney MVP. Marty averaged 23 points a game and also led Rapid City, 20-5, in rebounding and assists. He was named all-state and recognized by Coach and Athlete Magazine as one of the top 100 prep players in America. Bill Hauck recruited Marty to play collegiately at Black Hills State University. BHSU named Marty to its all-Century Team in 2007. Marty is CEO of Native American Health Center. He and wife Helen live in San Leandro, Calif. The South Dakota High School Basketball Hall of Fame is proud to induct Marty as a member of its Class of 2013.